Jeremy Corbyn is is offering exclusive access to regional journalists while shunning “largely hostile” national newspapers in a bid to get more positive election coverage for Labour, it has been claimed. Recent campaign visits by the Labour leader have seen national lobby journalists sidelined in favour of local media and the broadcasting media, who are legally obliged to provide balanced coverage. According to online news website Buzzfeed, the move amounts to a “concerted” media strategy ahead of next month’s vote. Its political correspondent Jim Waterson said Labour hopes to secure “friendlier” coverage by meeting members of the public through walkabouts on the street and doing clips for “heavily regulated” TV news bulletins and local newspapers. Jim highlighted Mr Corbyn’s campaign visit to Bedford on Wednesday, to which only local media outlets and a Press Association journalist were invited. 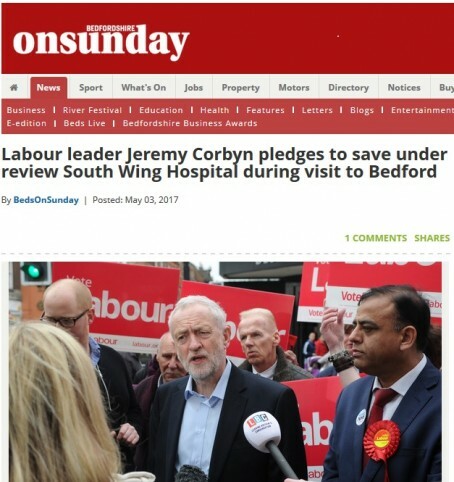 He cited the example of a story which appeared on the Bedfordshire on Sunday website afterwards regarding the Labour leader’s pledge to save a hospital in the town. By contrast, Prime Minister Theresa May was criticised earlier this week for restricting access to local journalists during a visit to their patch. Cornwall Live journalists claimed they had been banned from filming Mrs May’s visit to an industrial estate in Helston and that they were locked in a room to prevent them doing so. Wrote Jim: “Theresa May is under attack for running a seemingly stage-managed general election campaign, where she is being kept well away from members of the public in favour of surrounding herself at campaign events with favourable print news outlets. 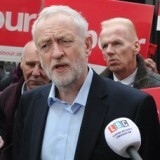 Jim told HTFP: “Corbyn’s team are adopting an interesting strategy, which is as much about mitigating damage which could be done by the national press as it is about actively choosing to exclusively use local papers. HTFP has asked the Labour Party for a comment. It will be interesting to see just how the local media handle this opportunity and whether they ask him the kind of tough,searching and relevant questions he clearly thinks he will be avoiding by keeping away from the political heavyweight national journalists and papers. It is a chance for local journalists and papers to shine if they grab the opportunity, press him on policies affecting their areas and aren’t ‘star struck ‘ in the presence of a national figure. Strange when you think of the extremely low sales of local papers, who no longer carry the weight they used to have. It’s quite apparent that he is after an easier ride than the nationals would give him and expects only softer more parochial easy to answer questions from a local scribe. As @word furnace points out ,it’s easy to get carried away by the chance to spend a few minutes with a political leader and forget the main aim is to question and challenge him on issues that will matter to your own community and readers so don’t be fooled by the faux interest in your high street or school , let’s be honest,the journos talking to him will be a little overawed and be happy to have a story to recount at the bar of how they interviewed him but this is a real chance to make a presence felt and challenge a leader for answers. Shocking posts above. What sort of arrogance leads you to believe that local journalists won’t ask the hard questions or will be ‘star struck’? I’d like to see the response to that from the MEN, Birmingham Mail, The Northern Echo and other big regionals. The reason Corbyn is giving greater access to the local press is because they are much more likely to present a straight and accurate account, rather than the politically motivated slants that virtually all of the nationals present as news. What’s the point? Anyone with a realistic outlook must realise he’s a no-hoper with nothing worthwhile to say. Roll on Mrs May. One would rightly assume the bigger cities and regional titles would have experienced staff to ask the relevant questions,however with so many local publishers relying on less experienced journalists and juniors, Corbyns people know they’ll get an easier ride than if facing the specialist political journalists from the nationals.